U2 are known for their political views and agitation to get policy change but where as a band like Rage Against the Machine would be all in your face – U2 are just as obvious but less angry – their last tour featured members of Amnesty International coming out on state during Walk On – a song dedicated to Aung San Suu Kyi, a Burman political prisoner and Nobel Peace Prize winner. Both band’s lyrics also push the barrel of whatever agenda they have – a long standing on for U2 has been referencing atomic war and nuclear issues. 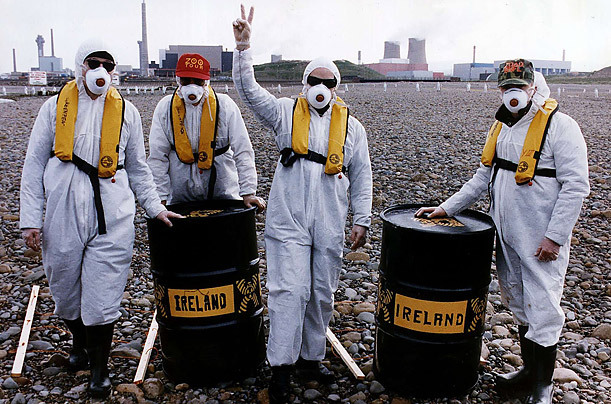 U2 also once famously protested against the Sellafeild nuclear plant by colluding with Greenpeace to stage an event on a beach near the site that was contaminated with radiation as the result of the power plant’s activities. That was as far back as 1982. "There is a line in 'Seconds' about a fanatic assembling a nuclear device in an apartment in Times Square, New York, but it could be anywhere. We are now entering the age of nuclear terrorism where a group of fanatics could have the capabilities of bringing a bomb into a city and holding millions of people to ransom." The Unforgettable Fire was released in 1984 in a time when the world was worrying itself sick about the arms race between the US and the Russians. Bono was inspired by a collection of paintings collectively known as The Unforgettable Fire which was a reference to atomic bombs being dropped in the Japanese cities of Hiroshima and Ngagasaki. Says the Edge of the art display (in the book U2: Into the Heart: The Stories Behind Every Song ) "the image of that purging quality, coupled with the insight it gave into the horror of nuclear holocaust, stuck in Bono's mind". It is perhaps ironic then the lyrics to song The Unforgettable Fire do not reference anything nuclear or atomic! The Wanderer, featuring country and western legend Johnny Cash from the Zooropa album was definitely suggestive of being set in a post apocalyptic world set under an 'atomic sky'. Lyrically it featured a character that appeared to be struggling to find some kind of spiritual identity. Another U2 album title also referred to atomic bombs in a most direct fashion – How to Dismantle An Atomic Bomb was a popular album that had a bonus track Fast Cars which gave the answer to the album’s question – one dismantles an atomic bomb with love. Are there any other U2 lyrics that refer to nuclear issues?